This page shows how to import data into a PowerPivot data model by running a DAX query. 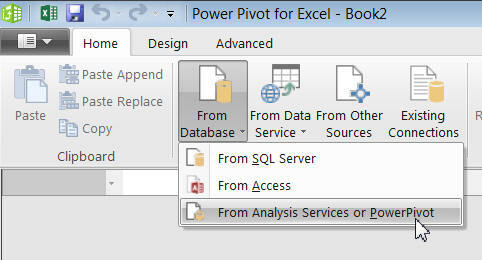 Once more, I'm assuming that readers already know PowerPivot. 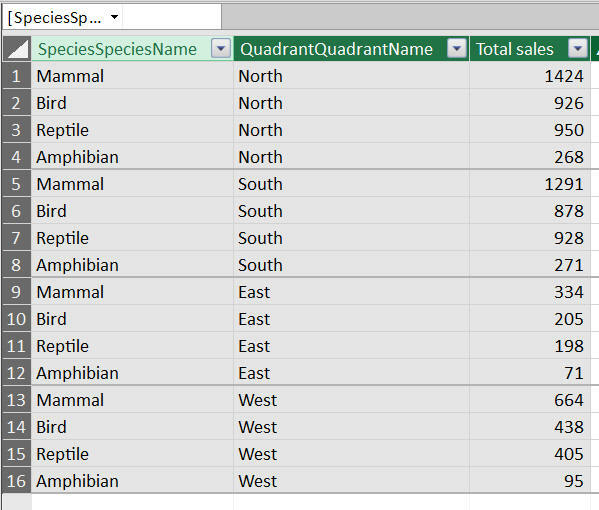 If you don't, a quick guide to using PowerPivot for tabular model users is covered in this blog. Alternatively, you could watch my YouTube tutorials, or attend a Wise Owl PowerPivot course. Choose to import data from Analysis Services. Type in the name of your server. We'll take data from our tutorial model. Here I've not only typed (OK, pasted) in a DAX query, but I've clicked on the Validate button (not shown in the diagram) to check it's OK. Reassuringly, PowerPivot tells me that my MDX statement is valid, even though it isn't actually an MDX statement! The results of running the DAX query shown above. You can obviously use the same trick to import data into PowerPivot from an Analysis Services multi-dimensional model cube, using MDX. And with that, I have run out of applications in which to use DAX queries!